Ridding your body of stubborn belly fat can be difficult. Women, especially, tend to hoard body fat around the waistline as they age due to hormonal changes, says the Mayo Clinic website. 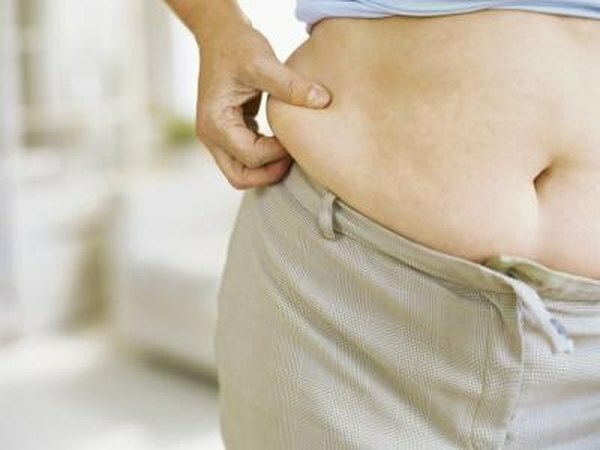 Once you decide you want to lose belly fat, you likely want to get rid of all the weight right away. However, the best way to lose belly fat is through a dedicated healthy diet and an exercise routine that burns fat and tones your abdominal muscles. Aerobic exercises are those that get your heart rate up. In doing so, cardiovascular workouts burn calories and fat from your body. According to the Centers for Disease Control and Prevention, you need at least 30 minutes of aerobic activity, five days a week, to burn enough calories to see a loss of 1 to 2 lbs. of fat per week. If you want to lose more weight, increase your workout duration to 60 minutes per session. Power walking, cycling and swimming are all moderate activities that burn fat. Consider the activities you enjoy doing to make exercise feel less like a chore and more like a gift you're giving yourself. Ramp up the effectiveness of your fat-burning potential by adding circuit training into your routine. Circuit training involves combining a variety of cardio and strength training exercises for a serious metabolism boost, according to Fitness magazine. Circuit training keeps your heart rate up while focusing on your major muscle groups including your arms, core, buttocks and legs. Complete a circuit training workout by performing about one minute of each activity or exercise and then switching to the next activity without resting. A typical circuit might include jogging in place for 30 seconds, doing 10 lunges, 10 pushups, 10 situps, 10 bicep curls and 10 squats before repeating several times. The plank exercise tones the abdominal muscles beneath your belly fat by requiring you to use your abs to hold your body in one position for an extended period of time. To do this exercise, get on your stomach on the floor. Place your weight onto your forearms and toes and lift your body off the floor, creating a straight line from your head to your toes. Pull your belly button toward your spine to engage your abdominal muscles. Breathe deeply while holding the plank for at least 30 seconds. Increase the duration of this exercise as you gain abdominal strength. V-ups are basically situps with a wider reach. This exercise tones your abdominal muscles so you're sure to have a sleek figure once the belly fat is eliminated. To perform a V-up, lie on the floor on an exercise mat with your hands stretched out above your head. Engage your stomach muscles as you lift your arms and upper body off the floor. At the same time, lift your legs off the mat as high as you comfortably can. Hold the position for several seconds, then slowly lower your legs and upper body back to the mat. As you gain abdominal strength, challenge yourself to lift your legs higher and hold the position longer.